Brachytherapy treatments using remote-controlled high-dose rate (HDR) machines are offered only in major centers. In recent days, conventional radiotherapy simulators (Sim) are being replaced by computed tomography Sims (CT Sim). HDR brachytherapy is carried out with multiple fractionations, and taking X-ray CT scans on all days becomes difficult. This will also impart additional radiation dose to patients by repeat scans. Two-dimensional (2D) localization methods achievable in low-dose orthogonal and nonorthogonal methods (using special Perspex jig ,) give equivalent accuracy. Mobile X-ray machines provide unsatisfactory radiographs preventing their usage after brachy applications in theater. An earlier study  has highlighted a possibility to provide satisfactory orthogonal radiographs with a hospital stretcher using a 500 mA diagnostic machine, but this technique was not standardized then. 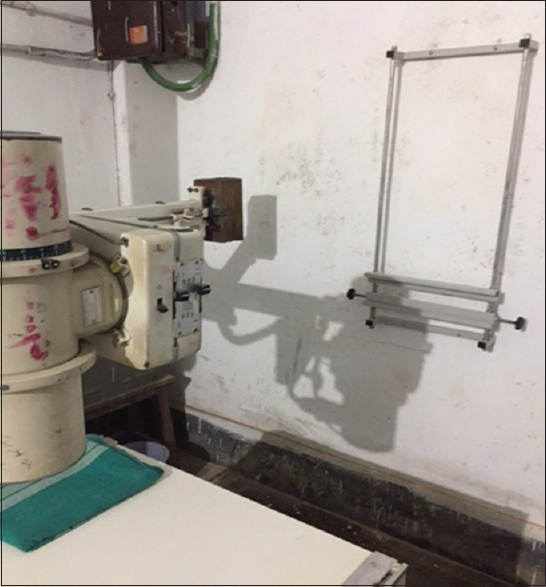 In the absence of dedicated radiotherapy simulator for HDR brachytherapy treatment planning, and to conserve resources of a CT Sim, our attempt to obtain solution with an old radiography/fluoroscopy 300 mA diagnostic X-ray machine is illustrated. In our cancer hospital, about 3000 new patients are seen per year and about 400 of them receive radiotherapy with a Theratron 780E (M/s Theratronix) cobalt machine  and microSelectron HDR (M/s Elekta). The hospital faces many resource constraints since it is non-governmental voluntary organization. 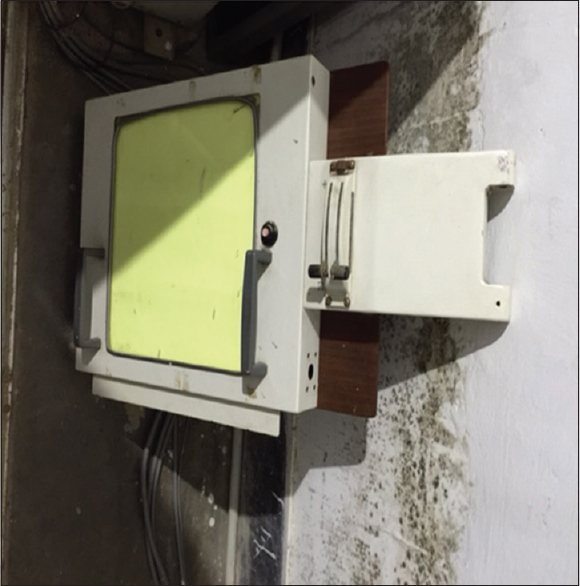 A diagnostic X-ray machine (PleophosD, Siemens, 120 KV, 300 mA) installed in 1995 available in this hospital is modified for our work. 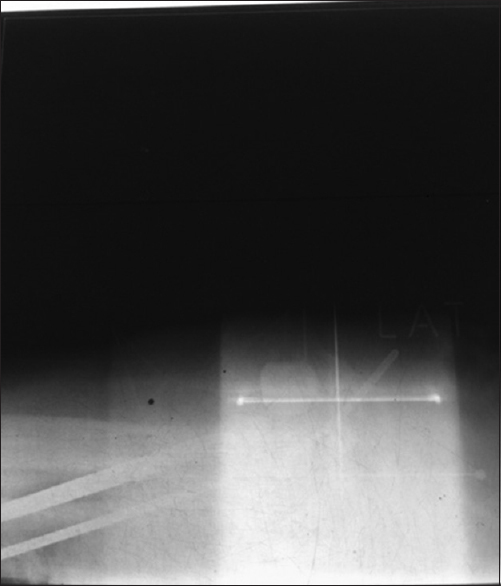 This X-ray machine had a “direct fluoroscopy image receptor” (2.5 mm lead equivalent screen), weighing 12 kg mounted as a counterweight to X-ray tube arm [Figure 1]. To substitute this counterweight, the “L-arm” carrying the X-ray tube is mounted with suitable weight [Figure 2]. With X-ray tube, assembly having one-head swivel movement and “L-arm” rotation movements can bring exposure positions for vertical and lateral (Lat) projections [Figure 3] and [Figure 4]. 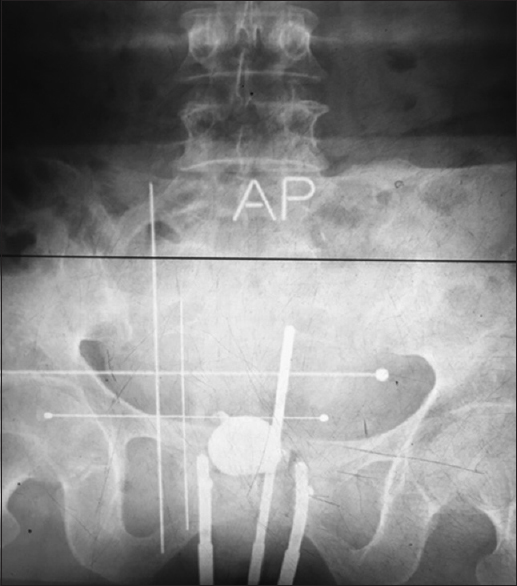 It could be seen that for brachytherapy applicator localizations, the patient is positioned in the gap area between the X-ray tube and chest stand wall for obtaining this anteroposterior (AP) and Lat radiography. The modification of the diagnostic X-Ray machine facilitated the possibility to use the Nucletron jig and to take AP and Lat projected radiographs without disturbing the patient's geometry [Figure 3]. The Lat projection is possible, by bringing the X-ray tube to the orientation shown in [Figure 4]. Furthermore, it is now feasible to obtain Lat radiographs to check field margins and matching of centers of the fields for head and neck radiotherapy portals. [Figure 5] and [Figure 6] show the localization radiographs obtained for an intrauterine/intravaginal microSelectron application. 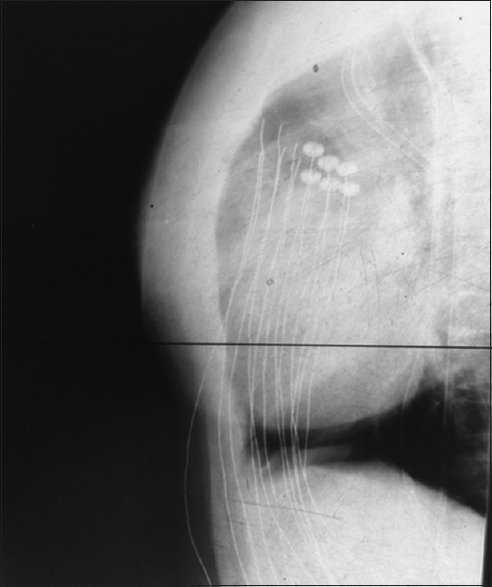 The radiographs to localize a breast interstitial implant for an HDR treatment, with custom-made copper wire markers inserted into plastic catheter tubes, are shown in [Figure 7] and [Figure 8]. We have highlighted a method to use existing diagnostic X-ray machine for obtaining brachytherapy localization radiographs. 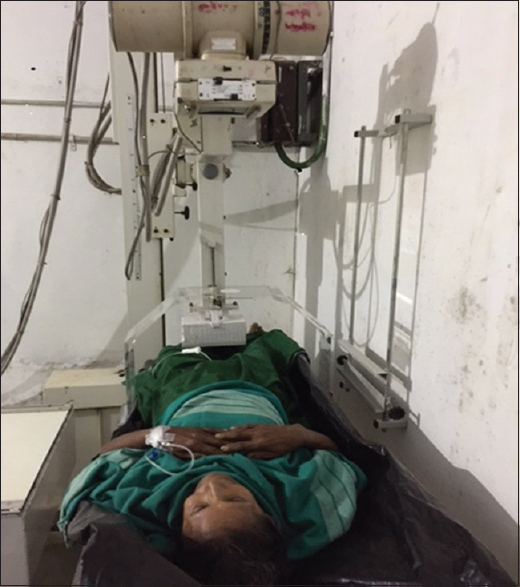 This also enables us to obtain verification radiographs for radiotherapy portals planned for the patient, before they are taken up for treatment. This work appears to be important especially in places where there are no dedicated therapy simulators and no CT simulator available for brachytherapy localization or when an alternative method is required in exigent situations. In olden days, the X-Ray machines were designed for conventional radiography as well as for direct fluoroscopy for barium meal or barium enema with multiformat films. Such X-ray machines have problems because this arrangement was designed to act as counterweight on the L-Arm. The presence of counterweight could not allow the vertical stand to travel near the edge of the wall and also to obtain the desired focus film distance, which were overcome by the present modification. With adaptation of this properly designed counterweight, the usage efficiency of our x-ray machine is now increased. This method makes it feasible to diagnostic X-ray machine. There may be an apprehension, why there is a need of old 2D localization method, in the era of 3D planning introduced as standard protocol for HDR brachytherapy. 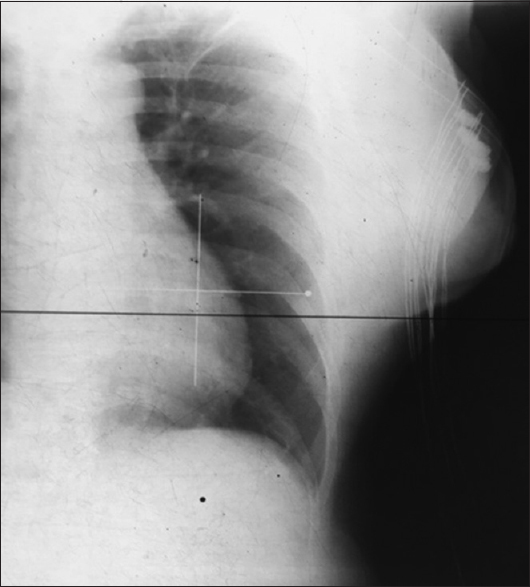 An earlier report  compared that jig radiography method gave equal localization results. Standardization of this technique will provide a dependable alternative to quality dose delivery even in paucity of facilities. The jig [Figure 3] has embedded cross wire marks both in the entry portals of X-ray beam along with lead shots to correct for slight differences in orthogonality as a quality assurance measure. 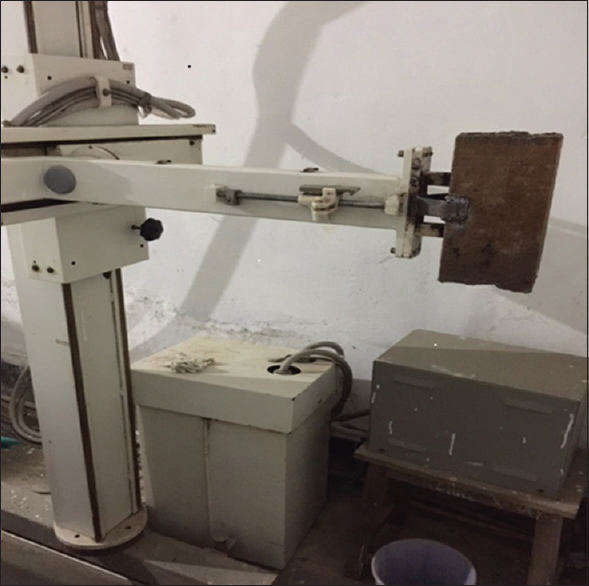 If focus-to-axis distance of 100 cm or 80 cm is obtained, this X-ray machine could serve as a simulator in principle. The jig also has “insert slots” for the “film cassette” or “computed radiography (CR) phosphor cassette” in perpendicular to the X-ray beam. In this hospital, lateral radiographs are not in the radiotherapy process, because of the use of CT Sim, but for the work of head and neck radiotherapy for large number of patients, which could be found in a report, there is a need for standardized radiography protocol, and this method therefore has applications. We are in the process of 2D dose planning method in our Oncentra treatment planning system for our brachy plans in intracavitary, interstitial, and intraluminal treatments. The authors thank the Director, Cachar Cancer Hospital and Research Centre, for the support in achieving modifications in X-ray machine. The authors would also like to thank Sri. Jantai, Electrician for the fabrication of mechanical structure. Orthogonal localization of applicators. 'Oncentra' Nucletron Treatment Planning Manual, 2000. Tyagi K, Mukundan H, Mukherjee D, Semwal M, Sarin A. Non isocentric film-based intracavitary brachytherapy planning in cervical cancer: A retrospective dosimetric analysis with CT planning. J Contemp Brachytherapy 2012;4:129-34. Ravichandran R. Localization Radiographs from Conventional Diagnostic X-ray Machine for Intracavitary and Implant Brachytherapy Applications. International Conference on Medical Physics. 6-9 November, AIIMS, New Delhi; 1998. Ravichandran R, Manimegalai C. Head and neck radiotherapy with telecobalt machine-efficacy and need for tissue compensation. Int J Radiol Radiat Ther 2017;2:25.